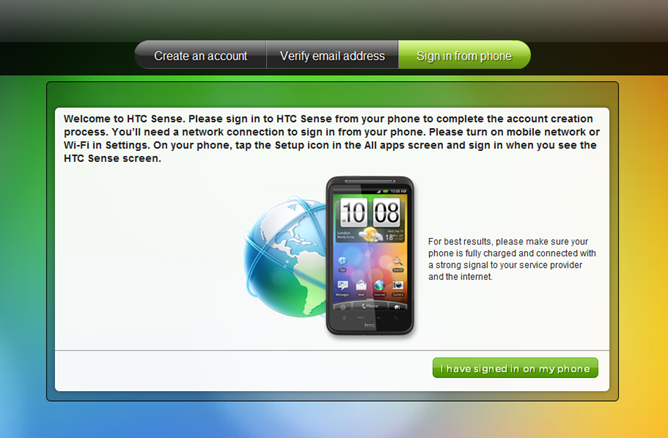 Last night, @IncredibleDoes threw a shout out on Twitter to let the world know that HTCSense.com was now live. While the selection of users and phones that can utilize the service right now is very (more like extremely) limited, it is still exciting to see this coming to fruition. There are devices both upcoming and already out that are slated to receive the new Sense, and it is nothing short of mind-blowing how much functionality they've added. If you want to go and check it out, go for it. If you don't have a Desire Z or Desire HD, you won't get very far because even after you register, the site prompts you to sign in from your phone. Since none of us are in the possession of either new Desire phones, we can't proceed, but maybe once you get yours, you will discover what is behind the magical "I have signed in on my phone" button.